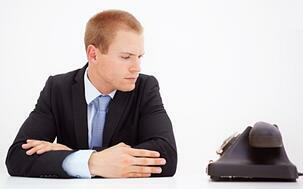 Is there anything more frustrating to a salesperson than a silent phone? Your lead generators have passed on strong potential customers, and your well-trained sales staff has reached out with e-mails, blog notifications, and phone messages. Voicemail can be a useful first step in making contact with a customer, but how can you make sure that the hard work of your sales team generates a useful response? How can you get the customer to call you back? We’d like to suggest 4 ways to (ethically) get a potential customer to return your salesperson’s call. We’re emphasizing the ethics of this situation because we believe that, at its heart, customer outreach is about establishing and building a relationship. Getting started on the right foot by strongly establishing trust and respect is a key part of getting that return call and developing long-term success. As the PracticeBetterBusinessBlog rightly states, “Selling with ethics must include giving the customer information that allows the customer to make a wise decision and to make the correct choice. Omitting information in order to manipulate the customer into a purchase has never been proper.” But it’s not only the ethics of building trust that matters-- there’s also a long-term economic pay-off: A recent survey by Kapost.com found that “Of the consumers in our study who said they have a brand relationship, 64% cited shared values as the primary reason. That’s far and away the largest driver” (emphasis ours). That sense of shared values can begin with an honest assessment between salesperson and customer of how your product or service can benefit them. Hard-selling, exaggerating or omitting facts about your company’s work is a bad first step, but being honest about how your product compares to others in the marketplace, how it might fit with a client’s needs, and what you do and don’t provide can be one good way to start a dialogue that could lead to a mutually beneficial relationship. Aurelie Chazel notes, “B2C customers are mostly looking at products that will benefit them personally. This is a good opportunity for you to get to know your final customer on a deeper level.” A sales call should be seen as a chance to understand a client’s personality and needs. What are common interests? What are a customer’s long-term professional and personal goals? What stage are they at in their buying cycle, and how can you best respond to the concerns a customer might have at that stage? What do they need to know regarding the product or service? A Solutions For Sales study found that “33% of all unsuccessful deals could have been won if the seller had been better informed and had acted more client-oriented.” Make sure your sales team is listening, as well as speaking, and projecting a sense of confidence and kindness when addressing a customer’s questions. Customers like to know they are receiving value-- in the form of assistance, information, and better understanding--much more than they like being “sold” a product or service. As Solutions for Sales noted, “Customers want to work with salespeople who bring business knowledge from a wide range of different situations; salespeople who can contribute new business ideas” and “More than 50% of customers expect salespeople to be better informed about client-specific requirements and goals.” Positioning your sales team as empathetic and knowledgeable gives potential customers a good reason to call back. It’s remarkable what a little curiosity, patience, and kindness can do. Sales expert Mark Hunter talks about “umbrella questions” “that get the customer talking more about what they’re looking for.” In our previous blog, we talked a bit about these sorts of questions: open-ended, directional questions that can give the salesperson a better sense of what the client needs, and give the client a stronger sense of connection and respect from the salesperson. If your sales team keeps good records of previous conversations, they can build on prior questions and focus the discussion in a manner that’s useful for salesperson and client alike (57% of customers feel that salespeople are poorly prepared or not prepared at all at initial meetings). It’s also important to make sure your team remains polite and professional in the face of delayed or re-routed calls, busy receptionists, and potentially cranky clients: they are the voice of your business to the broader public, and professionalism in the moment can pay dividends down the road, whether or not a specific lead pays off. Getting a customer to return a salesperson’s call is like many other parts of the sales/customer dynamic: it’s about building a relationship of mutual trust and need. Being honest about your product or service, asking questions and getting to know the customer’s needs, and providing service as well as sales are among the steps your sales team can take in turning a cold call into a warm client. What steps does your team take to get the customer to call back? Please share stories in the comments below!